Why? Because I have an image of a map, and I am too lazy to make a map based off it by hand, so I'll convert the pixels of the image to terrain types. Currently, my program isn't functional, and it's for Homm4, BUT... Homm3 uses the same format: map compressed into .gzip. So, if there is a demand, I can expand my project to work for both Homm3 and Homm4. I have this image. I will clean it up, pick a specific part of it, and then I'll be able to convert it into a H4 map. Nice! Would love to see such tool working for Heroes 1-3 too. Be warned though, my tool will only generate terrain types - the map will be devoid of any objects on it. That will have to be put on it by the player. That's how it must be done. Still, the mapmaker must remember that impassable terrain squares are colored with a darker version of a terrain color on the map. This is already possible for Heroes III through the WoG editor. I have 144x144 image to H3 map conversion program. Have written it myself, it creates 144x144 landscape and 144x144 obstacle images, so one should draw a map manually. Since that was long time ago, I don't even understand all the features I've implemented there. I can retell the idea. 1. You divide your picture into 2x2 squares. 3. Summarizing 4 minimal values of 4 pixels you minimize it again across the landscape types and then attach a landscape type with minimal sum to a square. 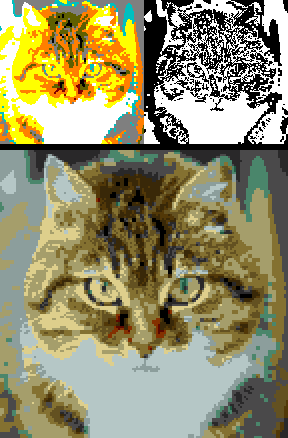 Rough conversion gives you a correct, but lower than possible resolution pseudographics. 1. For every pixel (independently) you try all possible combinations of landscape types and obstacle/free settings. 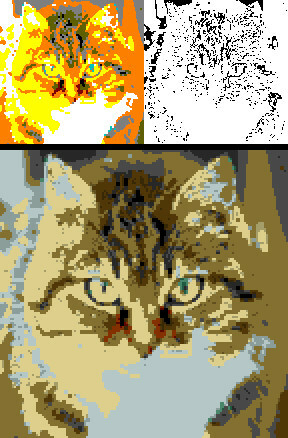 Attach a combination with minimal sum (as above) to a pixel. III. Through a number of iterations you remove incorrect places such as alone cells or thin (1-cell) bands from (II) using (I) as an origin. Together with a friend of mine, we have started working on the map converter even more than before. And I have already managed to get a few maps converted. Let me know if you want help on the H2 map format. Although the conversion is not exactly to grayscale, the number of colors in H3 is limited. Thus have you also tried with the relative corrections for human eye perciption? Thus have you also tried with the relative corrections for human eye perciption? I've tried it today. The result is in general worse than for equal coefficients. I found imagemagic for HIII but it generate only landscape. If it is possible good thing will be generating full playable map. Very good idea.